Puerto Galera, a town in Mindoro Island rich with stunning white sand beaches and marine life, is one of the most visited tourist destinations in the Philippines. In fact, not only double or triple of the town's population visits there for a vacation. Thousands of tourists--local or foreign--go there to enjoy the view, swim, dive, or just relax in the hotel, eat good food, or do some shopping! #1 - Sunset at Aninuan: Situated below Mt. Malasimbo, this peaceful paradise should not be missed most especially because of the stunning sunset from its beachfront. Feel the private ambiance with only 17 rooms, each having a private balcony with a view of the infinity pool and the ocean. The resort also has a fitness center, restaurant, and an own diving center that offers a full range of PADI courses. #2 - La Solana Suites: Just 2-minutes walk from the White Beach is this noticeable hotel painted in tropical bright orange. An ideal choice for a vacation, this hotel has a total of 23 spacious air-conditioned rooms equipped with modern amenities like cable TV and private toilet and bath with hot and cold showers. Other facilities include an in-house restaurant, outdoor swimming pool and kiddie pool, function hall, and massage area. #3 - Portofino Resort Hotel: Live like a royalty in this hacienda-style hotel in Small La Laguna Beach near Sabang Beach. Surrounded by coconut grove and other tropical plants, this hotel exudes an air of intimacy and exclusivity. Each of its 25 air-conditioned rooms has free wifi, cable tv, hot showers, mini bar, as well as a kitchenette with mini fridges. Activities such as diving, snorkeling, and sailing are also available at the resort. #1 - Resto Veranda: Satisfy your cravings in this restaurant secluded on a beautiful veranda (balcony) above the rocks at the White Beach. Enjoy different international dishes made from fresh ingredients as well as the amazing atmosphere and hospitality from the owners and chef themselves. #2 - Tamarind Restaurant: Dine and relax in this casual dining restaurant located on the beachfront of Sabang Beach. They have an extensive menu of Filipino and international cuisines and at night time, the bar area also serves different refreshing cocktails like their very own Mindoro Sling. #3 - Full Moon Restaurant: With a combination of great food, superb seafront view, friendly staff, and reasonable price, this restaurant at Small La Laguna Beach is a must-try. Though they mostly specialize in Australian dishes, they also have a wide variety of menu to choose from. Puerto Galera may not have huge malls or department stores within the area but it has a lot of shops that provide the tourists the convenience and experience that they look for in a tropical vacation. 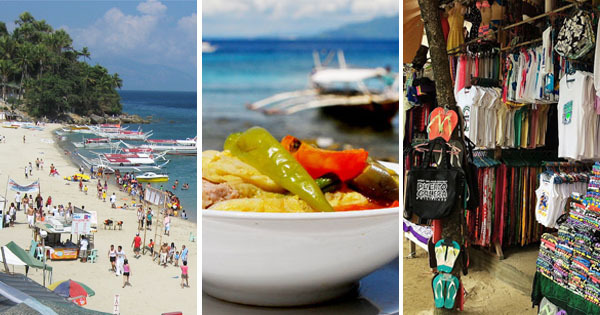 A tourist may even go to Puerto Galera without bringing anything as countless shops along the White Beach sell all kinds of beach items such as sun block, sunglasses, swimsuits, sarong, and cover-up that comes in different interesting designs. If you're searching for souvenirs and pasalubongs, the stretch of White Beach also has lots of choices of bracelets, key chains, ref magnets, bags, slippers, and t-shirts. Walking further on the other side of White Beach, Villa Natividad has shops that sell souvenir items at a lower price than the ones in the beachfront. Unique items such as native bags, wooden figurines, paintings, unique shirts, and the likes are also sold in a shop called Tree of Life. For more details, go to http://www.puertogalera.org.